This blog post describes the Dymola compilation process used to compile the C code generated during translation into an application file(s) that is used during simulation. Figure 1 shows the Dymola translation and simulation process diagram in which a Modelica model passes through to generate the Simulation results. Figure 1. Dymola translation and simulation process diagram. Step 2 of Figure 1 depicts how the C code is built into an application file(s). This build process is the focus of this blog post. Please note that this blog post has used Dymola 2018 FD01 for demonstration purposes. Dymola converts (translates) a Modelica model into C code by using symbolic processing techniques as described in a recent blog post: ‘Exploring Translation Log Statistics’. The C code generated is stored as dsmodel.c and dsmodelext*.c files (where * represents a whole number). There are a number of different compiler options supported in Dymola. However, the C code is built depending on the selected compiler and the translation methods. Dymola models can also be exported as FMUs by using the Translate toolbar on Dymola Simulation window as shown in Figure 3. Figure 3. Translate tab pull down option on Dymola Simulation window. When the build process is performed, an appropriate batch file(s) is called by Dymola based on the compiler option selected in the Simulation Setup in order to build the required application file(s). On the one hand, if a Modelica model is translated (or a build process is executed), no detailed log of the commands that were used in the build process is displayed anywhere except a brief summary of this build process is stored in a buildlog.txt file. On the other hand, for viewing the commands used in the build process in detail, some modifications can be made to the appropriate build batch files. For this editing purpose, Notepad can be used. If you do not have editing permission, then modify these files as described in https://www.nibbleguru.com/67_remove-read-only-attribute-windows-10/. Before proceeding the following steps, it is highly recommended to create a backup copy of the ‘<Dymola installation directory>\bin\build.bat’ file in your preferred location. Open the build.bat file available in <Dymola installation directory>\bin using a Notepad. In the first line change “echo off” to “echo on”. Add “echo on” after running the VS setup batch files are called (see Figure 4). Add a “pause” function to the end of this build file so that the cmd window stays open after the build is complete. Figure 4. Original and modified VS build.bat files. Press Normal pull-down option from the Translate tab on the Dymola Simulation window as shown in Figure 3. Once the model is translated, Windows cmd will appear that may look similar to Figure 5. Figure 5. Build commands in action when translating Modelica.Blocks.Examples.PID_Controller in Dymola. Figure 5 displays a cropped version of commands used by Dymola during translation and compilation of the C code in Windows command line. This cmd will stay open until a key is pressed. 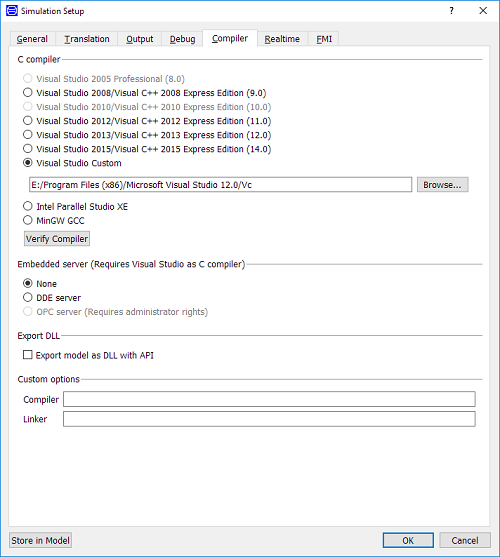 dymosim.dll DLL generated when Export with DLL and DDE server are selected. (Please note: dymosim.exe is also present with the DDE build and is used to run the dymosim.dll). <model name>.fmu FMU dll generated with FMU export option, this is packaged inside the <model name>.fmu file. <mex files> the mex files generated by dymmex.bat and dymmex4c.bat depend on the Matlab installation. 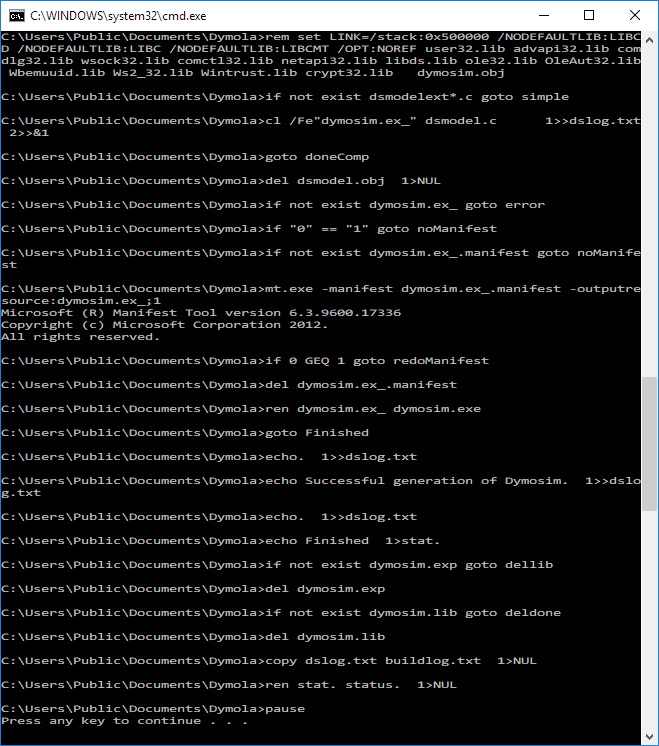 Remember to revert to the original version of the build.bat file in your ‘<Dymola installation directory>\bin folder.